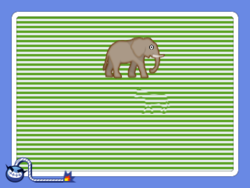 Stripy Sea is one of the animal-themed microgames featured in Kat and Ana's stage in WarioWare: D.I.Y. Showcase and returns in WarioWare Gold as one of Orbulon's microgames. The screen displays a white and green striped board. To win, the player must tap three camouflaged silhouettes that move among the stripes. However, only one silhouette appears at first; the other two gradually appear one after another until all three silhouettes are shown. When tapped, the silhouette reveals a sea creature. If all three are touched and revealed, the player wins. 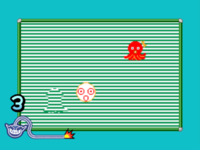 In WarioWare Gold, the sea creatures are replaced with animals, and all silhouettes appear from the start. Level 1: Two animals must be touched. Level 2: Three animals must be touched. Level 3: Three small animals must be touched. This page was last edited on March 11, 2019, at 18:40.